I've been thinking of trying the colour challenge at Embellish for a couple of days now - and when I saw Lucy's second challenge 'Wings & String" I had the perfect idea. 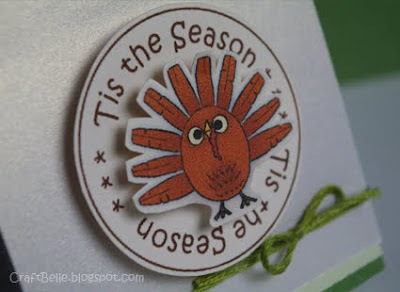 The colour scheme for Embellish is'Orange, Brown & Green' - which works wonderfully with my Turkey. I coloured him in Photoshop - printed, cut and popped him onto the sentiment 'Tis The Season'. Due to a slip of the finger with my printer he came out a lot smaller than I expected - so I made a mini card instead. 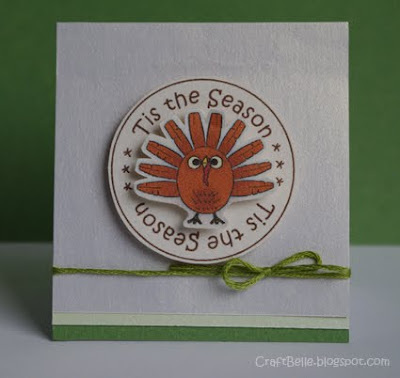 The Turkey image is from my 'Birds OF A Feather' stamps set at Squigglefly. The twine is DMC cotton thread #581. Papers by Kikki K & Misty. Fun turkey! Thanks for taking on an Embellish challenge! your card is super super cute!